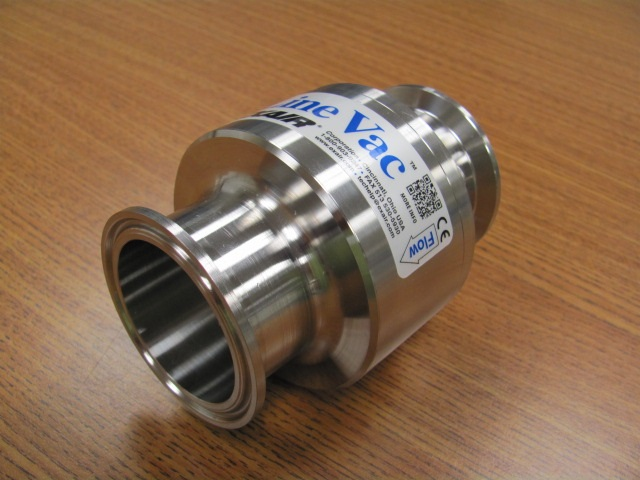 Just released, we are now stocking four different pipe sizes of Sanitary Flange 316 Stainless Steel Line Vacs. We are offering these in the following sizes, 1-1/2″, 2″, 2-1/2″, and 3″ Sanitary Flange. The performance is the same as our Stainless Steel Line Vacs, but now it is even easier to install in sanitary flanged piping systems. No need to get adapters or have specialty shops weld flanges on. The new Line Vacs are available for purchase on their own or in a kit which includes the Line Vac, a mounting bracket for the Line Vac, pressure regulator and filter separator. The only parts you provide are the clamps, gaskets and compressed air supply. These are the latest four additions to our already extensive line of in-line pneumatic conveyors. 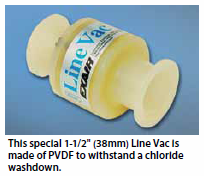 If we do not offer a stock Line Vac that will fit your needs, we also offer custom Line Vacs to fit virtually any need you may have, just contact us and we will help you determine what will work! The latest and greatest news from EXAIR that you may have seen in trade magazines is our High Lift Reversible Drum Vac System. While some of you may have seen these in the catalog and possibly even bought one before you saw this picture in a magazine, we hadn’t released them to the world through press yet. This latest addition to our Industrial Housekeeping product line will help you remove liquid from sunken pits, wells and below grade vessels. 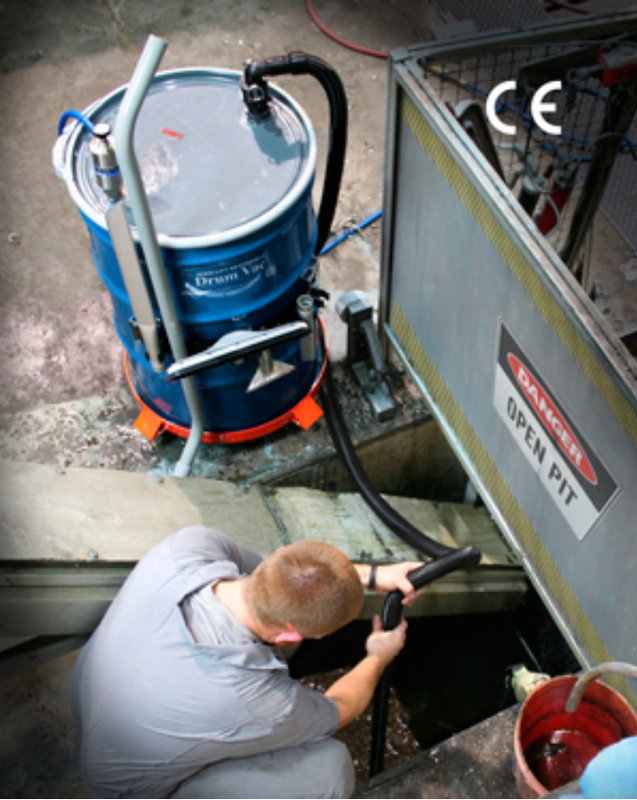 The High Lift Reversible Drum Vac provides up to 15′ of lift while pumping 38 gallons per minute! As with many of our other vacuums there are no moving parts to wear out or fail and they can be run continuously in harsh conditions. 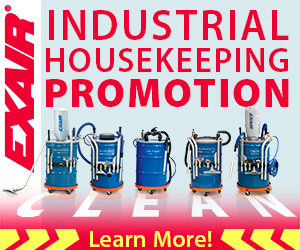 These vacuums are the workhorses of our Industrial Housekeeping product line and could be the last vacuum you ever buy! So stop burning up electric vacuum motors and take advantage of our 30 day unconditional trial to test it for yourself. EXAIR’s High Lift RDV makes cleaning out pits easy and fast. We generate so many new products that the magazines can’t keep up with them, that is unless you would want to see a miniature EXAIR catalog in the new products section of your favorite trade magazine. So keep an eye out, you might just notice something that we snuck onto the web page or into the catalog without you noticing. As long as our customers continue to have a need for new and different product, we will continue to support them and expand our product offering. To top it all off, we will never bore you with the same press release month after month or year after year trying to act like a product is actually new. One of my favorite hobbies over the summer months is going camping with my family. I grew up camping with my grandparents, brother and 2 cousins. My grandparents did have a camper but the majority of the time, the 4 of us kids, camped behind the trailer in tents. My wife on the other hand was a “newbie” to the whole camping scene so when we decided to begin this adventure we purchased a low-cost, lightweight hybrid style camper so she could have all the amenities to keep her comfortable – a bed, A/C, toilet and TV. This year we were planning on going on an early vacation in May so I wanted to get the camper out of storage and prepare it before we left so when we got back we could start our weekend camping trips right away. 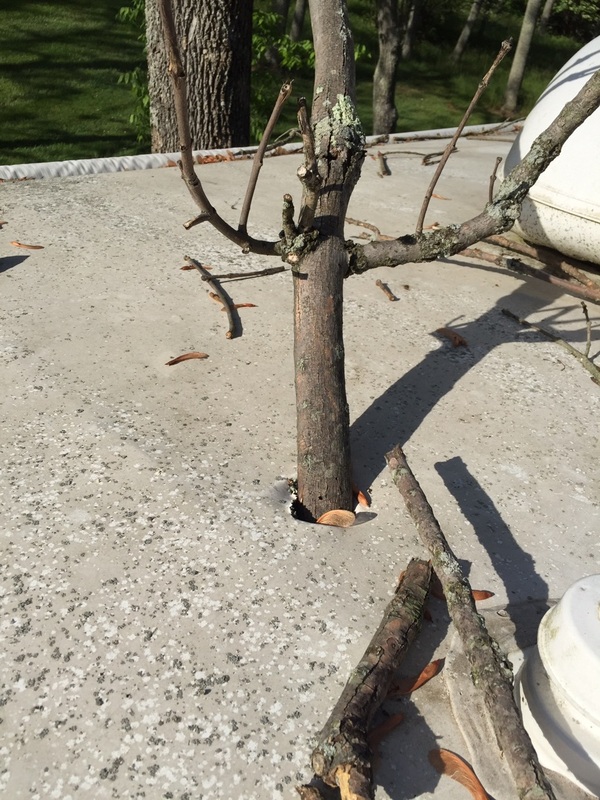 I headed over to the storage lot only to find a tree branch had fallen through the roof! Needless to say, I was not a “happy camper” (pun intended). Not only that but it appeared it happened some time ago as the ceiling and certain parts of the floor were getting soft from rain. I immediately called my insurance company to file a claim and dropped the unit off at my local RV shop. After about a week, I received the call from the RV shop advising of the repair costs which were about $3,000 higher than the actual value of the trailer. 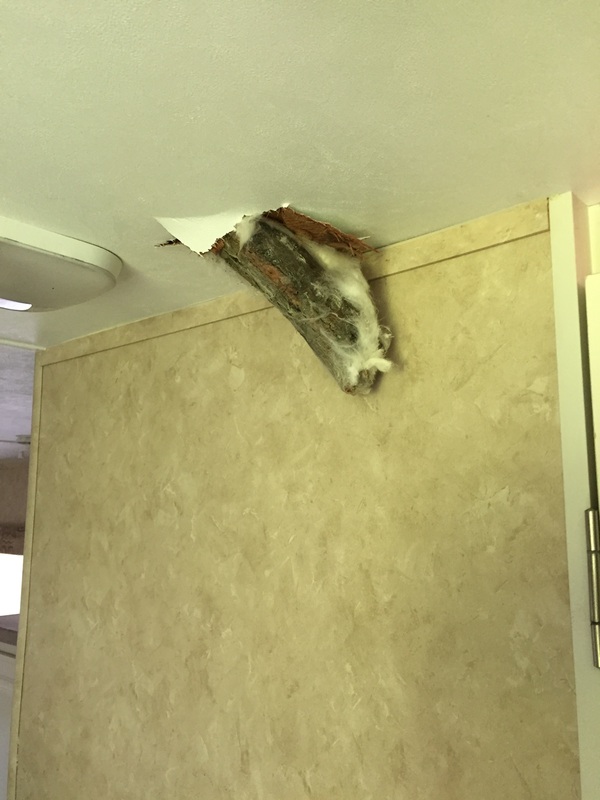 The insurance reviewed this information and determined the unit as a total loss and would be issuing us a check for the market value of the unit. We were somewhat bummed because we really liked our little camper and the memories we shared. Our oldest son learned to ride his bike w/o training wheels and he caught his first fish while camping in that trailer. Now that my wife is on board with camping and with the extra $ in our pocket, it’s time to shop for a bigger, new camper – I am thinking 5th wheel! This also means a truck upgrade to something bigger, at least a 3/4 ton, something I am sure will make my wife happy. Keeping with the bigger theme, here at EXAIR we recently released our NEW 1/2″ Atomizing Nozzles. The larger size allows for higher flow rates and larger coverage areas. Internal Mix Narrow Angle Round Pattern – Flows up to 231 GPH, require pressurized liquid and air. Internal Mix Wide Angle Round Pattern – Ideal for covering a large area, adjustable to a fine mist or heavy spray. Internal Mix Flat Fan Pattern – Perfect for efficient output of costly liquids. Internal Mix 360° Hollow Circular Pattern – Provides 360° even flow in all directions. External Mix Narrow Angle Flat Fan Pattern – Able to handle thicker fluids than internal mix and providing independent air and liquid control. Siphon Fed Round Pattern – For non-pressured liquid applications, up to 24″ of suction lift. All of the above are also available with our No Drip feature to stop the liquid flow after the air supply has been turned off. Sit, Stand Or Lie Down? So far this year at EXAIR has been great. We continue to have a lot going on and I should remind you to keep your eyes on our news feeds (Blog, Twitter, FB or G+, RSS) because there will be plenty of announcements throughout the year. One announcement we currently have is that in 2013 we achieved a 99.9% success rate for on time shipments. This makes our run go to 18 years of maintaining 99.9%! That, to me, is a huge statement on the type of business EXAIR is and the hard-working folks which make up our organization. We want to make sure that if you order something from us, you get the right part and you get it on time. Another announcement that is on a personal level. 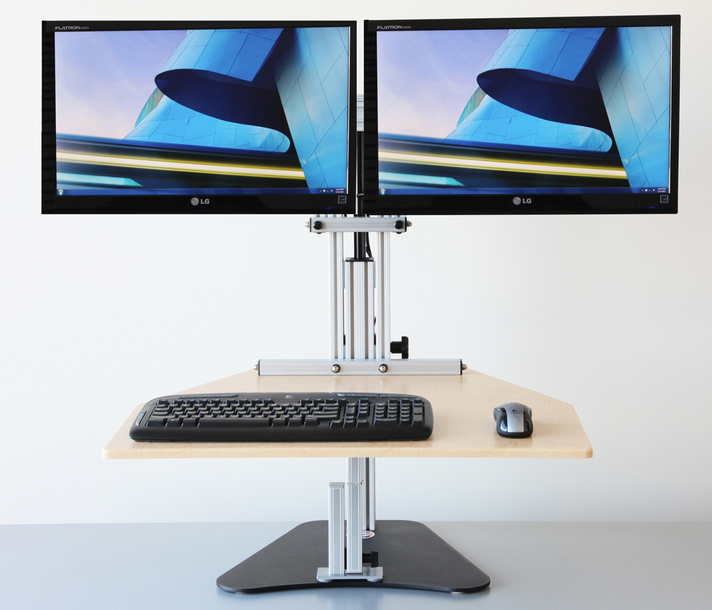 I finally did it – as I type this blog I am in front of a standing desk. So far I am on full day number two of standing and I am liking it. It does feel pretty strange to be the only one standing up in an office where everyone else is sitting. The best part is the reactions that I have gotten from everyone else. Some of the people don’t see why you would ever want to do it or how you could, while others have been rather intrigued by it. Another residual benefit is my recollection of this skit from Whose Line Is It Anyway: Sit, Stand, Bend Over. I guess the point of this (other than getting a clip from one of my favorite shows on TV) is I am hopefully going to be standing at this desk while EXAIR continues to grow and satisfy our customers. There are several things I am positive will happen again in 2014: 1. 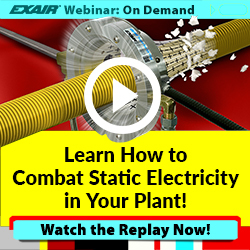 EXAIR will continue to release new product 2. 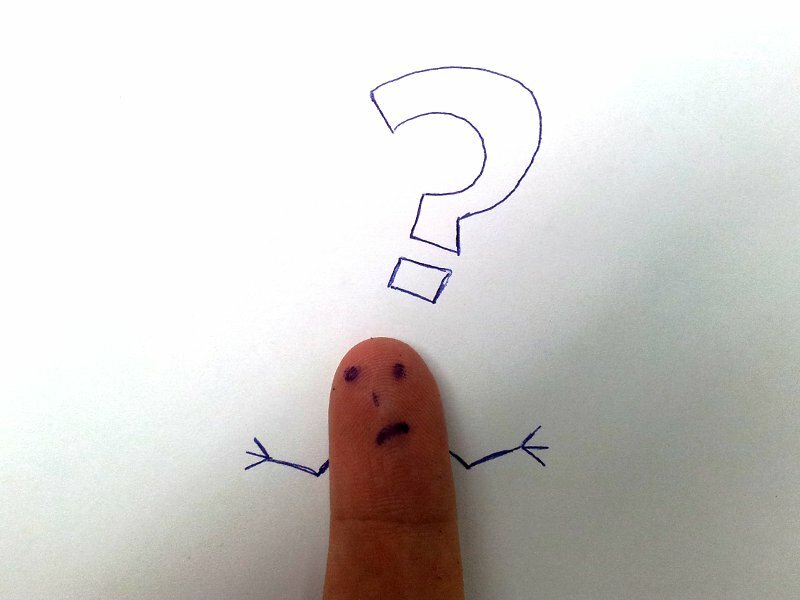 We will offer you a multitude of ways to get our input and help if needed and 3. We will stand behind our products once you have them. This post may be a little late for some as most schools have already started back for the new year. My wife’s school starts back on Monday and she is in a new classroom and teaching a new grade this year. So this meant a good amount of work for me as she had a big idea of what she wanted her new room to look like. Now when I was in school all the rooms looked the same except the posters on the walls changed. We never had any rooms that were painted anything other than off-white (maybe it was just dirty white). Now there are rooms that are painted like a jungle or an ocean to help immerse the students into the learning experience. Luckily for me my wife is not artistic and she knows I hate painting so she went a little less extreme. 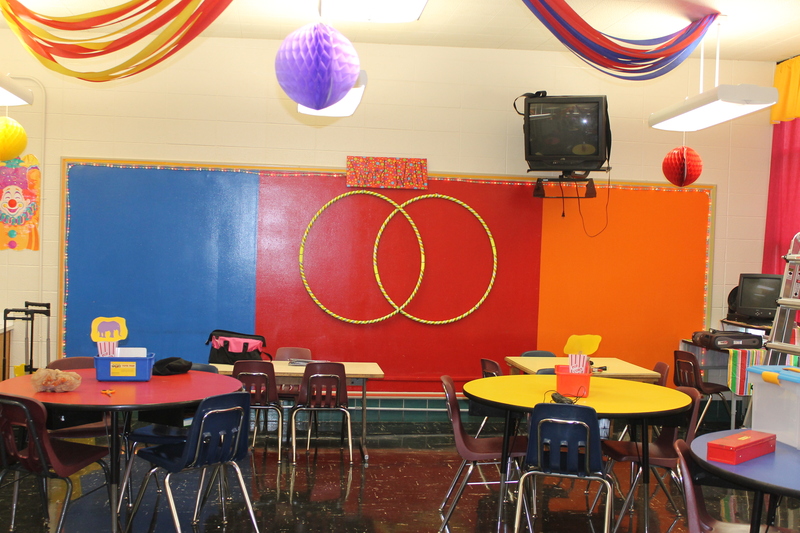 Her deciding factors on the room theme were driven by these bold bulletin boards at one end of the room. She said all she could think about when she saw them was the circus. 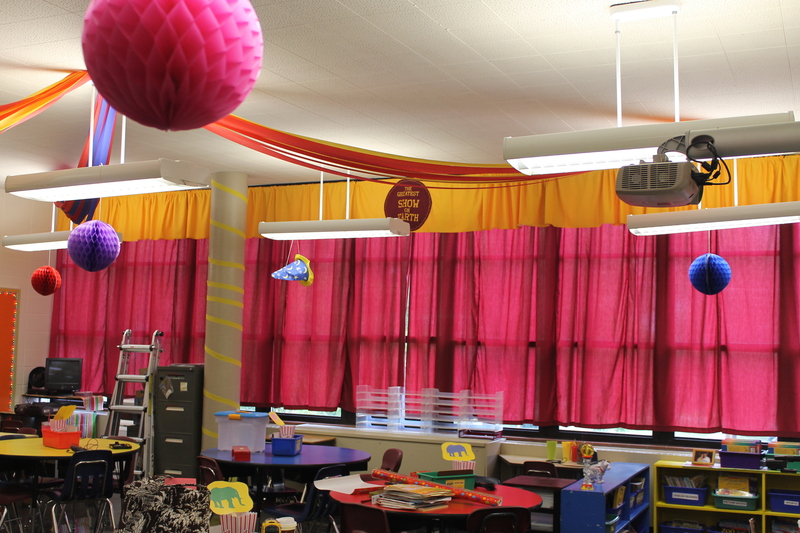 So this year the students in her class will be immersed into the “Greatest Room On Earth” . The biggest project she had, was to make the wall of windows appear as the entrance to the circus, this meant curtains. My mother helped her make the curtains and a valance, (I didn’t know what this was until I put it up). Then my dad and I had the lovely task of figuring out how to hang 30′ worth of curtains. After a full day of work and only one run to the hardware store we got the final results. So far some of the kids have seen it and it’s a huge hit. The only part that didn’t get done was the tight rope. Now I know what your thinking there’s no way they could pull that off. The tight rope wasn’t going to be big enough to hold weight but it was going to have a toy on it that would go from one end of the room to the other and also to hold papers. Maybe we can add that before the end of the year. The ingenuity that I put into hanging 30 feet of curtains on a wall and ceiling that has no mounting area is the kind of ingenuity all of the Application Engineers here at EXAIR give to your applications every day. All we need is your big picture and some information and we’ll give you our best idea to make it happen.